Edgar Hunt and his brother Walter who were born in Birmingham, were the third generation in the Hunt family to become artists. His grandfather was Charles Hunt (1803-1877) who was well-known for his humorous genre subjects which he exhibited from 1846 at the Royal Academy and other prestigious venues. Edgar’s father was Charles Hunt Jr. (1829-1900). He painted in a similar vein to his father but he also did some animal subjects. With this background of artistic achievement it was natural for Edgar and Walter (1861-1941) to become painters. Edgar had no formal art training but was schooled by his father. He specialised in painting exquisitely detailed works of farmyard scenes and animals, executed meticulously in a realistic style which never changed throughout his career. Hunt was devoted to animals from a very early age. He had originally intended to be a farmer and had worked on a farm near Lewes in Sussex for a short period. The artist lived in the Midlands and sold many of his pictures there. As a result of the Industrial Revolution the middle classes in England had grown increasingly wealthy. Those who had made money in the towns yearned nostalgically for an image of the country and the demand for animal paintings was huge both in England and abroad. Hunt continued the tradition of English animal painting which had begun with Landseer. Landseer was the first English artist to portray animals for their own sake, imbuing them with human characteristics and emotion. Other artists of the period continuing the pastoral tradition were T.S. Cooper, E. Verboeckhoven and Verhoesen. 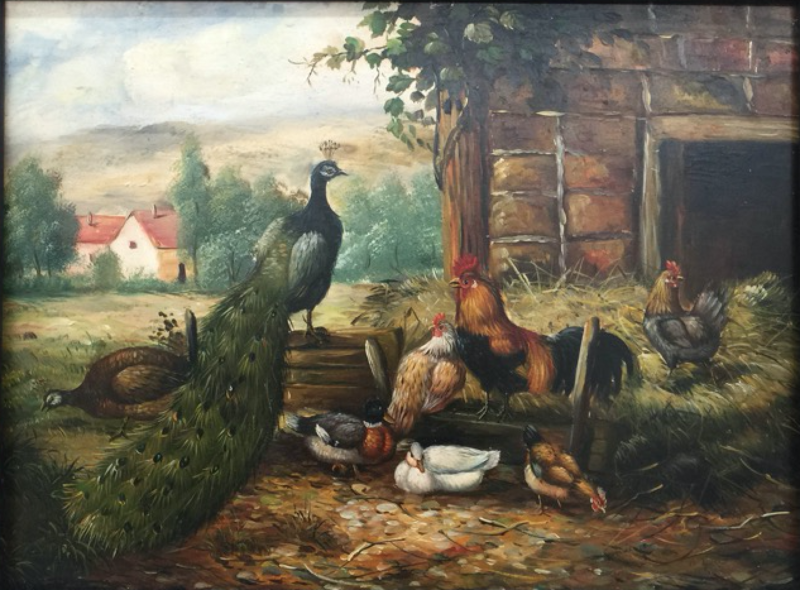 Edgar Hunt was best known for his paintings of chickens but he also painted other birds such as ducks which were very popular during the period. Donkeys, goats and ponies were also in demand and at which he excelled. He was not a public man and rarely exhibited his work. However, he did show eleven animal scenes at the Royal Society of Artists in Birmingham and ‘Feathered Friends’ was exhibited at the Walker Art Gallery in Liverpool. He was a great friend of the artist J.F. Herring Jr. (1815-1907) by whom he was influenced artistically. Highly successful during his life-time, Edgar Hunt remains ever popular to this day with collectors throughout the world avidly seeking his work.